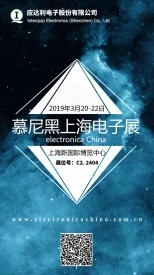 During March 20 to 22nd 2019, Interquip will attend the 2019 Electronica China at Shanghai New International Expo Centre. Our stand is at Hall C2, 2404. We sincerely invite you to come visit us at the show, thank you!